Sturgis, SD (February 25, 2014) - The Sturgis Buffalo Chip announces that the GRAMMY award winning Zac Brown Band will perform its down-home hits at the Chip’s 33rd annual Motorcycle and Music Festival. The genre-bending group will headline the festival Monday, Aug. 4, 2014, following the Buffalo Chip’s annual Legends Ride celebrity charity event. 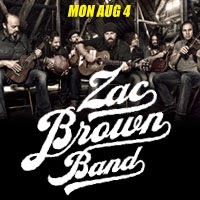 Zac Brown Band joins the nine-day superstar lineup of concerts, hot off the tail of their recent critically acclaimed studio EP, “The Grohl Sessions Vol. 1.” The festival takes place Aug. 1-9 and will include performances by Mötley Crüe, Alice Cooper, Lynyrd Skynyrd, Florida Georgia Line, John Mayall and many others. The Buffalo Chip will continue to fill out the festival lineup with some of the biggest names in music and will be announcing more bands throughout the year. Masterful skill and an ability to break down genre barriers have brought Zac Brown Band a tremendous level of success since forming in 2002. The renowned group has won eight out of its fifty-five total music award nominations, produced three platinum-selling albums and amassed a staggering eleven No. 1 hits on the Billboard Country Charts. Passes for the Buffalo Chip’s 33rd annual Motorcycle and Music Festival are on sale now. All concerts are free with camping. For more information or to get passes to the Largest Music Festival in Motorcycling™, visit www.BuffaloChip.com or call (605) 347-9000. Mr. Indian of Holland; Tony Leenes, developed an electric starter motor for the old Indian Big Chief models. Tony explains; "These bikes are not always easy to kickstart, and as we all get a little older, the question often asked was, what can we do to make it start easier? The answer I came up with, was an electric starter. The E-Starter for old Indians comes as a complete bolt-on kit, with no major modifications required." It took Tony Leenes two years to develope the electric starter kit for Indian Big Chief models, and the presentation was at the MOTORbeurs in Utrecht, The Netherlands. Be sure to put your sound system on to enjoy the sound of this beautiful engine! Special thanks to Inge for the video!